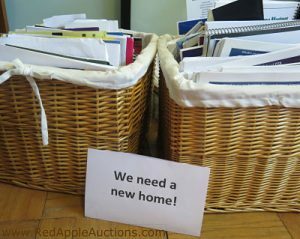 I suspect many auction planners consider their auction catalog to be a necessary evil. It might be viewed as a “must do” because allowing advertising in the piece is one of the few sponsorship benefits a company or individual receives for investing in the fundraiser. Others see it as a vehicle for sharing information about the nonprofit, describing the auction items, or even as a place to hold less interesting content, such as benefit auction rules or checkout procedures. But catalogs (or “programs,” as some groups call them) can be used more strategically, if a bit of thought is put into them. Every so often — usually when I’ve developed a mad case of deep cleaning my house — I’ll pull together collections of auction catalogs and offer them for sale on my website to get them out of my home. People love them! Those programs offer a wonderful way to see how other groups are organizing their fundraisers. Flipping through a catalog is a bit like being a fly on the wall of someone else’s gala. You don’t get to eat the food or bid on items, but you can be inspired with ideas that will usually encourage you to change your own gala a bit. In today’s video, I show you two catalogs from events I worked this fall. You’ll see how each group — one being a Texas public school foundation and the other a New Jersey senior resource center — used similar concepts in different ways to encourage guests to take their program home and use it. Are you putting anything “extra” into your benefit auction catalog that is similar to these organizations? If so, I’d love to hear what you’ve done that is unique. In the video, I mention that getting guests to take home your catalog can start to help you with sponsorships. Do you want to bring in more money via event sponsorships? I have a highly-rated webinar that teaches you how to enrich your sponsorship program. In it, you’ll see countless examples of how my clients have thought “outside the box” to use sponsors creatively at their auctions. When you start using fresh approaches to showcase your sponsors (and by the way, sponsors do NOT want tickets to your auction! That is NOT a good benefit for them!) you’ll build stronger relationships with them. A solid sponsorship program can add $1000s of dollars to your event revenue. And I’m not kidding, even a little bit. 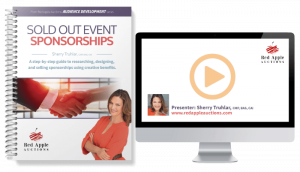 Learn about Sold Out Event Sponsorships. And if you’ve got ideas on how to personalize a catalog, post those below. I chair a church auction. Not sure what I can add to my “gift list”, but I look forward to reading comments to get a few ideas! Karen, I had one reader email some ideas she had after watching this video post. She was encouraged to add her ideas to this blog but hasn’t. I’ll take the liberty of posting her email to me, removing her name and the name of her church. “We appreciated the suggestion in the Red Apple video on adding items to our Spring Festival catalog that our attendees might find as useful and thus retain it for future reference. Since our event is March 7, 2015, and features a Spring theme, we’re now planning to add Spring “To Do Checklists” for spring cleaning, and for the home and garden. To educate attendees (internal and external) on all of our ministries, we’re adding is a crossword puzzle. All major clues will involve these ministries. (A separate two-sided ministries flyer will be available on the Ministries table as a “cheat sheet”). Additionally, our Easter services and celebration events (concert, Maundy Thursday play) will be featured on a beautiful bookmark at each place setting, so both our members/constituents and external attendees will have a ready reference. I thought these were great ideas and perhaps you will as well. Thank you for the video. We are a private school that holds a sold-out spring auction primarily attended by parents. After viewing this video, I thought it might be fun to provide instructions on “how to create a masquerade mask with your child” in a fun layout for parents. Other suggestions are appreciated! Lisa, I think that is BRILLIANT! I suspect you are doing something Mardi Gras-esque with your auction, so this fits in with your theme nicely. It’s a great idea.